Lisa Wood's installation, Openings, is on exhibition until Saturday, Nov. 17 at Neutral Ground in Regina. BRANDON – After a successful opening recently, an exhibition by Brandon University (BU) faculty member and visual artist Lisa Wood will run until November 17 at a Regina art gallery. Wood’s exhibition, Openings, presents a unique perspective of an exhibition opening at Neutral Ground. In October 2017 Wood documented the opening of the exhibition Canada’s Rectangle at Neutral Ground. Using time lapse photography she captured Regina’s art community from the perspective of the bar and snack table. 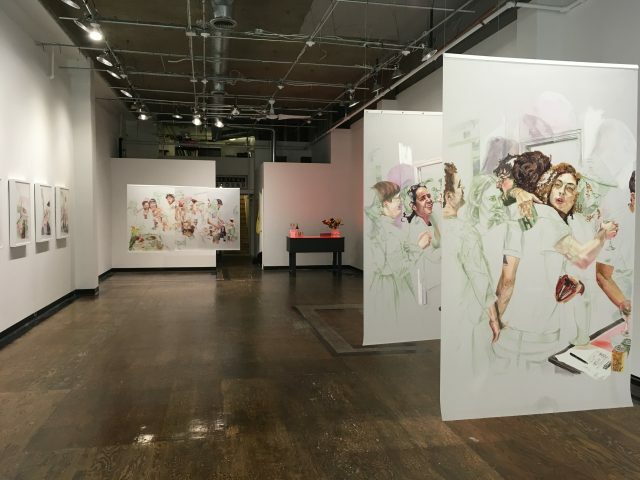 From the resulting hundreds of source images she has created layered paintings on Mylar that look at the relationships and behaviours of the subjects. 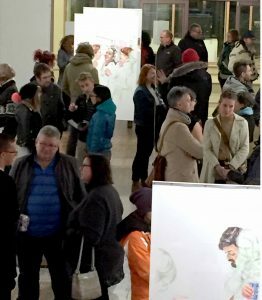 A strong turnout was on hand for the opening of the Lisa Wood exhibition Openings at Neutral Ground in Regina. Wood exposes tension between what we hide and what we flaunt, what is socially acceptable and what is taboo, what is attractive and what is repulsive through the frameworks of ritual and social norms. She has been drawn to acts of eating and drinking because of the specific social expectations they evoke, and the contradictory nature of consuming food and drink in public – we eat and drink to be relaxed or soothed, yet we leave ourselves open to exposing pleasure and the grotesque. The opening weekend of the exhibition, which coincided with Regina’s Nuit Blanche celebration, featured a special audio installation and performance by Brandon-based multi-instrumentalist Brendon Ehinger. It was followed the next day by an artist talk given by Wood. The exhibition is open Tuesdays through Saturdays, from 11 a.m. to 6 p.m., at Neutral Ground, an artist-run center located at 1835 Scarth St. in Regina. Wood is an Assistant Professor in BU’s Department of Visual and Aboriginal Art. She holds a Master of Fine Arts degree from Yale University and a Bachelor of Fine Arts from the University of Manitoba. She has been the recipient of many awards and scholarships and has exhibited her artwork nationally and internationally.